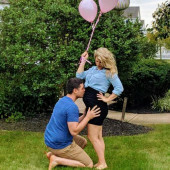 We are so excited for the arrival of our baby girl, her expected due date is 1/29/2019! We have had a lot of fun over the last 6 months preparing our house for her arrival. Vince has done an amazing job converting our guestroom into a beautiful nursery. We are so thankful for this new chapter in our lives and thank you for being apart of it. I hope everyone finds this registry convenient it has a list of the items we are registered for in one place but shows you multiple places to buy the items. We are so excited to see all of you at our little girl's baby shower!